Analysis of large-scale representative datasets shows that a vegetarian meal is the cultural practice of a minority of India’s population. At a time when food has provided so much grist for the identitarian and nativist mill, it is important to infuse into public discourse a modicum of reason through facts. For long, India has been mythologised as a vegetarian, and particularly beef-eschewing, society. Such a representation has further been ideologically explained (and justified) by a wide range of scholars, politicians and popular discourse by constructing India as a society primarily shaped by religious norms which purportedly ‘explain’ the proclivity to vegetarianism and the beef-taboo. Such a representation has had obvious consequences over the last century or so, and much more recently in the openly toxic mixture of communalism and casteism. While much has been done (and continues to be done) by scholars, particularly historians, to dispel this narrative, the scale and near-legendary status of the above representation has made it difficult to counter in a systematic manner. A key assumption that stands as a hurdle in countering this myth is the idea that social groups (such as religious communities or castes) in India are homogenous, with their members simply following culturally-prescribed norms of behaviour. Such assumptions hide the immense variability within any social group. They also contribute to false representations of Indians as exceptionally anti-individualistic and group-oriented. Indians thus appear as ‘cultural dupes’, mutely following rather than actively questioning, challenging, bending and transgressing social norms. This short essay, a summary of our article in the current issue of the Economic and Political Weekly, is a challenge to the above representation of India and Indians. In that paper, we analysed three representative large-scale datasets of self-reported behaviour (National Sample Survey, National Family Health Survey and India Human Development Survey) to establish some basic facts about what ‘India’ eats. The findings seriously question many public claims about food habits – and importantly, suggest that no general claim based on a social group can pass muster. How prevalent is vegetarianism in India? The extent of overall vegetarianism is much less than common claims and stereotypes suggest; survey estimates show that between 23% and 37% of the population of India is vegetarian. Thus, far from being a vegetarian nation, India is a meat-eating majority nation. The notion of ‘non-vegetarian’ and the discourse around vegetarianism, then, reflect the hegemony enjoyed (thus far) by the ‘minority’ vegetarian population. Where are the vegetarians in India? 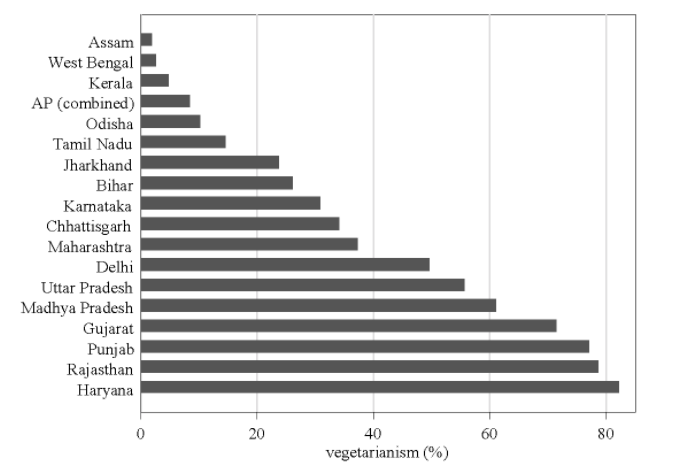 There is considerable regional variation in vegetarianism, although there is a pattern – states in India’s west and north have a relatively higher level of vegetarianism compared to states in the east and south. Six states (all in the northeast) have less than 2% incidence of vegetarianism. Among states with at least two crore population, three have less than 5% (Assam, West Bengal and Kerala) and three have over 75% (Haryana, Rajasthan and Punjab). 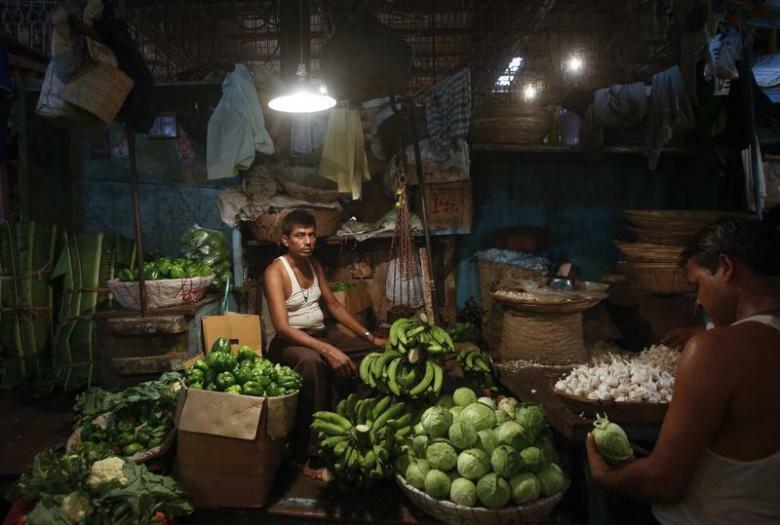 These regional patterns could be due to the agro-ecological availability of foods, cultural politics related to locally-dominant social groups (castes, religions) and gendered differentiation in food habits. Intriguingly, there is little substantive difference in vegetarianism between rural and urban locations. Vegetarianism increases with urban size, from small towns to large towns to small cities to large cities. However, complicating this picture, the megacities have a lower incidence of vegetarianism. Any explanation for all this would need to include the fact of working-class migrations from different parts of India and across castes and religions. How internally diverse are social groups in India? There is considerable variability within social groups, trumping all stereotyped characterisations, especially those based on religion and caste. This, therefore, also complicates generalised characterisations of ‘India’ based on meaningless averages. Apart from Jains (overwhelmingly vegetarian) and Sikhs (majority vegetarian), no other religious category is majority vegetarian. Hindus – by far the largest group in the population – are majority meat-eaters. Turning to government mega-caste categories, incidence of vegetarianism is least among STs, but closely followed by SCs, and it is higher among OBCs and highest among non-SC/ST/OBCs. Further, we see immense variation even among Brahmins, with only two-thirds of Brahmins and one-third of ‘forward castes’ being vegetarian – much lower than stereotypes would have it. How does gender shape food practices of groups? Overall, the incidence of vegetarianism is higher among women than men, and the gap is substantial (almost ten percentage points, with incidence among women almost 50% higher than among men). 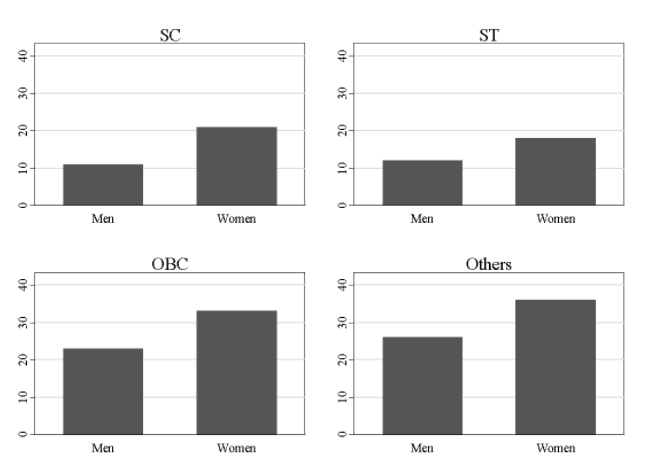 Interestingly, the size of the gender gap is similar between rural and urban areas, across different city types and across mega caste categories. Further, the gender gap is greater in regions where overall incidence is greater. A portion of the gender gap may be related to the fact that men eat outside of the household a lot more than women do, and with greater moral impunity than women. This allows men to enjoy greater ‘flexibility’ from norms in a patriarchal context. The other side of the same coin is that the burden of maintaining a ‘tradition’ of vegetarianism falls disproportionately on women. Overall, the significant gender gap within social groups and regions makes claims of a group and regional ‘traditions’ problematic. How prevalent is beef-eating in India? Although there is a paucity of data sets and a greater likelihood of underreporting, it appears that the extent of overall beef-eating may surprise everyone. On the one hand, it is much more than the beef-taboo stereotype suggests, while on the other it is far less than – and with significant variation within – religious and caste groups stereotypically thought to eat beef. Nationally, at least about 7%, but more realistically closer to 15%, of the population eats beef. The incidence of beef-eating is 42% and 27% among Muslims and Christians, respectively; the incidence is 5% each for Hindu SCs and STs. And yet these figures – themselves likely reflecting underreporting – mask large variations within groups: the incidence among Muslims is 7% in Rajasthan and 67% in West Bengal, and the incidence among SCs is close to zero in Rajasthan and 22% in (undivided) Andhra Pradesh. How do political ideologies impact self-reporting of food practices? There is evidence of cultural-political pressures affecting reported and actual food habits. 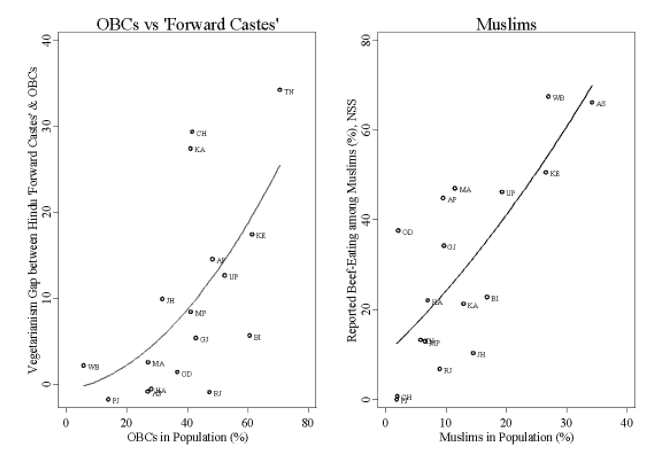 For instance, on average, states with larger shares of OBCs in the population also tend to have larger vegetarianism gaps between OBCs and Hindu ‘forward castes’ – indicating a possible ideological ‘breaking free’ by OBCs. Similarly, states with larger shares of Muslims in the population also tend to have more incidence in reported beef-eating among Muslims. It is striking that the four southern states top the list of beef-eating among SCs in the major states; these are precisely the states with a relatively longer and stronger history of Dalit liberation movements. All of this suggests that any reported data need to account for the bias towards underreporting of meat and beef, and over-reporting of vegetarian diets, due to the social hazards of such admissions. Hence, the title of our paper underscores the need to provincialise vegetarianism. To conclude, analysis of large-scale representative datasets shows that a vegetarian meal is the cultural practice of a minority of India’s population. It is important to complicate most pictures of food habits in India by attending to variations (across different dimensions of location type, region/state, social group, gender and class – and within social groups). Attention to variations allows us to better understand the social processes that sustain social phenomena such as food habits. What is claimed as a group or national ‘tradition’ is not innocent of power and struggles over hegemony. Basic questions such as ‘what is food’ and ‘who decides who can eat what’ get determined in the registers of power, desire, identity and preferences. Balmurli Natrajan is an anthropologist at William Paterson University of New Jersey and Suraj Jacob is a political economist based in Udaipur.